[19:04] <+Jason> Uh, Hi everyone, I’m Jason Paul McCartan and I’m a gamer. I did one of those things where you make a game and sell it and people buy it. I’m the guy behind InfiniBadger Press, and I’ve been running OSRToday for a few years. [19:04] <+Jason> A few weeks ago, I released Polyhedral Dungeon, a modern ultralight take on classic dungeon-crawling games. [19:05] <+Jason> It’s a concise and compact game that plays with a modern set of rules, emulating B/X D&D in some ways, but it also breaks many of the tropes. While complete in a single game, it’s going to be expanded with additional supplements. [19:06] <+Jason> The core system is also being used to create other games including a modern day supernatural game, a science fiction game, and some others. Soon there’ll be a very comprehensive license that allows people to create non-commercial and commercial content for it. [19:06] <+Jason> I like badgers. [19:07] <+Jason> That’s pretty much it. [19:07] <~Dan> The floor is open to questions! [19:08] <~Dan> Just before we officially started, GeneR asked if this were a Kickstarter. I know that it’s not, but will you be Kickstarting any of the supplements you mentioned? [19:09] <+Jason> Dan, no. 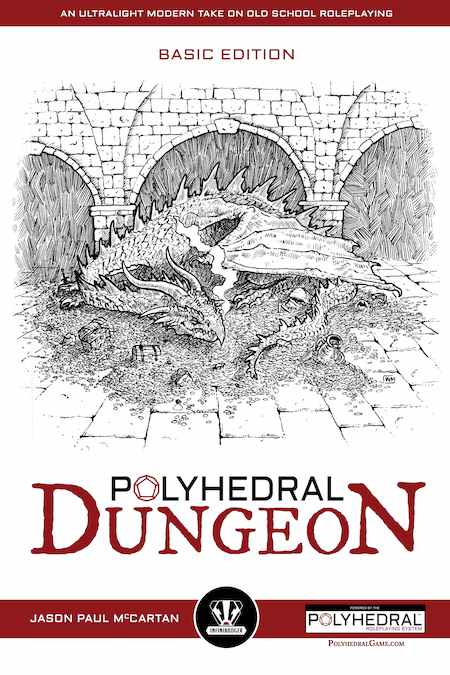 The plan is not to do any Polyhedral products as Kickstarters. I think Kickstarter works great for a lot of products, and InfiniBadger plans to use it in the future for a couple of projects, but Polyhedral is basically a boostrapped self-funding line of game products. [19:11] <+Jason> Within a day of launch it hit #1 on the main bestsellers and bestselling small press, and was there for a week. It did well over at DriveThruRPG as well. It actually hit Copper first there before RPGNow, and is now Silver at DriveThru. [19:11] <+Jason> xyphoid, PD (Polyhedral Dungeon) doesn’t use any of the mechanics from B/X, but it uses the philosophy of the game and the design around resource management as is template. [19:12] <+Jason> In PD, there are four attributes (Body, Mind, Soul, Social), all of which have different polyhedrals attached to them that go up in size. A little like Cortex or Savage Worlds. [19:12] <+Jason> Rolls are made against other character’s attributes, or against difficults, which also use dice rolls. [19:13] <+Jason> There’s a bunch of scaling elements, as well as different ways to influence die rolls. [19:14] <+Jason> Characters get the ability to get free dice to add to a dynamic dice pool as they do things by getting “Advantage”, or by spending Brownie Points (sort of fate and XP points rolled into one). [19:14] <~Dan> Given this setup, does the scale top out at 1d20? [19:15] <+Jason> Characters also have Talents, which provide abilities, like in the standard classes. but they’re more flexible. [19:15] <+Jason> Dan, only in the Basic Edition, because it sets up play at what is called the Heroic level of play. [19:15] <+Jason> There are additional levels of play that come after this that scale the game up. So you can end up being superheroes, demigods, gods, and then multidimensional heroes. [19:16] <~Dan> How are such levels of ability represented? [19:16] <+Jason> Those details come in The Advanced Rules book that comes out soon. PD Basic Edition is meaned to be lean, mean, and fast to play. [19:17] <+Jason> A lot of that has to do with probability and maths, but essentially each level adds +10 to each die roll possibly. That way you can have neighboring play scales interacting with each other. [19:17] <+Jason> So, if you at the second level of play, a tough monster who isn’t scaled up can still be dangerous to you. [19:18] <+Jason> And if you’re playing at a set level, and all of other major characters are playing at that level, you disregard the additional bonuses. [19:18] <+Jason> If you have d8+20 for Body, you’ll whomp on a Kobold, for example. [19:18] <+Jason> But if you’re going up against another demigod-like character, you’re just rolling dice against each other. [19:19] <+Jason> And a level of play where you can actually end up going toe to toe with him/her/it. [19:19] <+Jason> Oh, and all of the various games have their own Monster books, all of which can be used by all of the other games. [19:19] <+Jason> So the Book of Aliens and Book of Cryptids and Book of Monsters are all interchangeable. And all contain complementary and different creatures. [19:20] <+Jason> You want to have goblins in your modern day Cthulhu game? Easy to do. [19:20] <+Jason> Need more aliens from another reality? Sorted. [19:20] <+Jason> Everything is designed to be modular. [19:20] <+Jason> Especially the rules. [19:20] <+BPIJonathan> How easy is it to convert from existing OGC systems? [19:21] <+Jason> There’s no direct translation, but it’s pretty easy. [19:21] <+Jason> There’s actually a free Judge’s Kit being released as a living document that will explain stuff like that. [19:21] <+Jason> So it’ll show how to convert spellsa and feats into Talents etc. [19:21] <+Jason> And explain the design methodology. [19:22] <+GeneR> Typical Races, Human, Elf, Dwarf, Hobbit, and so forth? [19:22] <+Jason> But PD is different in its design philosophy. People who play D&D will encounter things that are different. [19:22] <+Jason> GeneR, in the Basic book there are the standard B/X race as class classes. Cleric, Magic User, Fighter, Rogue. Then Halfling, Elf, and Dwarf. [19:23] <+Jason> The Advanced Rules break it down so you have Species and Classes apart. There’s 20 of each going into that book, with many of them being backported for use a Basic classes. [19:23] <+Jason> And people will be able to build and create their own. [19:24] <+Jason> Many of the standard tropes are there, but with little twists. [19:24] <~Dan> Oh? Like what? [19:24] <+Jason> In the PD Basic book, for example, Elfs take damage from being in contact with metal. So they take extra damage from metal attacks, or from being in contact (so wear gloves etc). [19:25] <+Jason> But they have a Talent called The Elven Way. As they level that up it unlocks abilities that are beneficial, including removing that. As well as things like cursed items no longer automatically bond with characters. [19:25] <+Jason> Magic users can use padded armors (armors are broad categories), but can use ALL magic armors. So a magic user in magic plate? That’s a thing. [19:25] <+Jason> Clerics get access to resurrection early. [19:26] <+Jason> Fighters have access to lots of combat abilities they can mix and match. [19:26] <+Jason> Halflings start off being able to take from Rogue lists of Talents, but as they go through Halfling Specialist, they get access to the Fighter ones too. [19:26] <+Jason> And that’s just stuff in the Basic book. [19:27] <+Jason> The Advanced Rules add a slew of other options that Judges and players can plug and play. [19:27] <+Jason> Like allow access to non-class talents, and even having Judges build Talent trees like in Skyrim or other video games. [19:28] <+Jason> TAR also brings in strongholds, settlements, fame, and other things to enhance play. Lots of little additional combat rules, as well as ways to use Brownie Points to engage players. [19:29] <+Jason> As well as different ways to play and scale for one on one play and solo play. [19:29] <+Jason> Oh, and going GM-less. [19:29] <~Dan> You mentioned a “Body” attribute. I’m leery of holistic physical stats due to their inability to distinguish between force and finesse, strength and speed. Do you have a way to address that issue? [19:31] <+Jason> Dan, TAR brings in the ability to split each attribute further if you want to make things more complicated and do that. But it doesn’t have great depths of granularity. Because the focus is on the rules melding into the background so the players interact. [19:33] <+Jason> I think I just killed chat. [19:33] <~Dan> Are talents the same as skills? [19:34] <+Jason> Yes and no. [19:34] <+Jason> They’re skills, powers, spells, feats. Anything that can make a character unique. They’re given broad names, and then there are different Levels in each that can be unlocked that either improve benefits or add new ones. [19:34] <+Jason> I mentioned The Elven Way. [19:35] <+Jason> At Level 1, Elves are better at sneaking than others. [19:35] <+Jason> That would normally be a Body roll, which Elves start with at d6. But with that Talent at that level, they get it at one die step higher, so they roll a d8. [19:36] <+Jason> The average shifts about +1, but the potential increase in effect is a up to 2 points. [19:36] <+Jason> And if they have Advantage, they get to roll two dice, and keep the highest result. [19:36] <+Jason> Brownie Points can be spent to get extra dice (to roll and keep the highest), or get a straight +1 bonus. [19:37] <+Jason> At Level 2, which needs to be bought with Brownie Points, they get Darkvision on top of Low-Light Vision. Because they have both, they don’t get a penalty when going into bright light from the dark. [19:37] <+Jason> Level 3 gets them using metal gear and no longer taking damage. [19:38] <+Jason> At Level two, they get to fire two doing the same damage, at the same target or different ones. [19:39] <+Jason> At Level 3, three etc. [19:39] <+Jason> So, there’s lot of customization. [19:39] <+Jason> Oh, and characters can do multiple actions as well. But it raises the difficulty of success. [19:40] <+Jason> So that Magic User? Could fire two Lightning Bolts at Level 1, but each is more difficult to hit with (one die step per extra action). [19:40] <+Jason> Which can be offset by items or even the Speed Talent being cast before. [19:40] <+Jason> So, players will come up with character tactics, and party tactics to handle ways to encounter combat. [19:40] <+Jason> Not all Talents are focused on combat, though. [19:41] <+Jason> But combat is a bit part of games, and it’s where a lot of thought in design went into. [19:41] <+Jason> In many other games, players just go from fight to fight, take that 15 minute work day, and never suffer consequences. [19:41] <+Jason> PD has it built in that you can suffer for doing that. [19:42] <+Jason> Damage is tracked by wounds applied to attributes. [19:42] <+Jason> And there’s a thing called Strain, that is fatigue and stress that applies to all attributes. [19:42] <+Jason> So, while you’re fresh and have no wounds or strain, fire as many spells or talents as you want. [19:43] <+Jason> But as soon as you cross a certain threshold, for many of them, apart from having your dice rolls lowered from the wounds and strain, now you need to roll to see that you don’t add MORE. [19:43] <+Jason> And as you go from combat to combat and don’t rest, you can tire out. [19:43] <+Jason> So, items, potions, clerics etc. all become important. It’s about resource management, built into the game system, and the gameplay. [19:44] <+Jason> There are times you’ll NEED to run away. [19:44] <+Jason> And old school gamer rules apply: encounters don’t need to be balanced. [19:44] <+Jason> There are Boss Monsters in the game, which is a way to take standard monsters and then buff them. [19:44] <+Jason> They get increased stats (at three different levels) and access to their own Brownie Points as well as Talents. [19:45] <+Jason> But if you beat them, you get more rewards to grow. [19:45] <+Jason> And you’re continually earning xp as Brownie Points as you play. A point here, a point there, 3-4 points for an encounter. [19:45] <~Dan> From your earlier statement, I take it that you’ve done away with Vancian magic? [19:46] <+Jason> And you then can store them, or use them during your combats to save your skin, including canceling damage. [19:46] <+Jason> Dan, yes. No vancian magic in this game. Think of this more like a MMO game. [19:47] <~Dan> So is there any limit on spellcasting? [19:47] <+Jason> But also getting wounded or tired. [19:48] <+Jason> Because wounds start to affect the effectiveness of things. [19:48] <~Dan> But spellcasting itself isn’t tiring? [19:49] <+Jason> Until you go over the threshold. [19:49] <+Jason> Which is a combined 2 Wounds/Strain. [19:49] <+Jason> And then you have to check to see if you add more strain. [19:49] <+Jason> So it can become tiring. [19:49] <+cecil> how do you accumulate strain? [19:49] <+Jason> In short, if you’re fresh and unwounded, cast away. But get tired or wounded, and now you’re going to start increasing difficulty. [19:50] <+Jason> Cecil, great question! [19:50] <+Jason> The two main ways is by using Active Talents. Talents are either Active or Passive. Passive cause no Strain. Active may cause Strain if you’re at that threshold and activating them. [19:51] <+Jason> The second is taking non-lethal damage, which doesn’t cause wounds, but basically tires you out (and also stuns you). [19:51] <+Jason> There are other ways, but that’s up to the Judge making rulings. [19:51] <+Jason> So running into a wall? [19:51] <+Jason> Running hard and fast from an enemy. [19:51] <+Jason> Being stressed out or frightened. [19:51] <+Jason> It’s anything that stresses you. [19:52] <+Jason> Oh, and you get strain from encumbrance. Carry too much, you can have ongoing strain. [19:52] <+Jason> (Which is why you have Torchbearer Followers, to carry your stuff). [19:52] <+cecil> does a fighter’s attacks suffer from strain as well? [19:52] <+Jason> The game is built on the Judge making a lot of rulings and interpretations. So you don’t need to learn too many rules, but be able to make a call based on the context of what’s happening. [19:53] <+Jason> Some of them. [19:53] <+Jason> There’s one called Power Attack that requires activation. That gives you an extra damage die for melee attacks for the rest of the combat. [19:53] <+Jason> But Melee Specialist is passive, so doesn’t. [19:54] <+Jason> But each of those take an action to activate. [19:54] <+Jason> So you either activate them one each round, or both at each round, and take the hit on the difficulty increase. [19:54] <~Dan> It’s nice that you’ve given fighters something to do other than swing each round. [19:54] <+Jason> I took that into consideration. [19:55] <+Jason> They’re two-weapon specialists as well if they take that. [19:55] <~Dan> FUS RO DAH? [19:55] <+GeneR> Jason just wanted to say I am still hear. I like a lot of stuff you are saying and have thought along the same lines on some things. I like the fact that damage directly effects attributes. [19:55] <+Jason> There’s an awesome Talent called Teamwork that gives +1/+2/+3 to attacks when working with another character that has it. [19:55] <+Jason> Heh. Skyrim reference. [19:55] <+Jason> There’s a Talent called Shout. You shout at enemies and stun them. [19:56] <+Jason> GeneR, No worries. [19:56] <~Dan> GeneR is a recent Q&A guest himself. [19:57] <+Jason> TAR will give a bunch of other Talents, and there’ll be more available for free by us, as well as the community when the license gets released. [19:57] <+Jason> Oh, and PolyhedralGame.com is the main portal for all things Polyhedral. [19:57] <~Dan> Can you walk us through how combat works? [19:58] <+Jason> It’s the pretty standard round-based combat, each round lasting 5 seconds. [19:58] <+Jason> During each round you can move, do an action, do free actions like simple touches etc, and say something quickly. [19:59] <+Jason> You CAN do multiple actions, but like in the d6 system, each additional one increases the difficulty. [19:59] <+Jason> So, sure, do 5 things on your round. But they may fail. And some may be sequential (or parallel). [19:59] <+BPIJonathan> So if White Spy comes up on Black Spy guarding a trunk, and White Spy wants to cast a fireball at him…. how does this work? [20:00] <+Jason> Initiative is rolled using Body and Mind, so you roll those and add together, taking away Wounds and Strain. [20:00] <+Jason> BPIJonathan, fantastic question. So, if White Spy has been sneaking and isn’t noticed, he gets Advantage (an extra die to roll, keep the highest). [20:01] <+Jason> Sneaking is an opposed roll using Body of the sneaker vs the Mind of the watcher. [20:01] <+Jason> There are other modifiers in play such as sound, vision. [20:01] <+Jason> So if Black Spy was looking away, but was listening… well, it depends how loud things are. [20:01] <+Jason> If it’s deathly quiet, Black Spy gets a +2 to his rol. [20:02] <+Jason> If there’s some distracting noise, he could be at -2. [20:02] <+Jason> So, roll against each other, the highest wins. [20:02] <+Jason> So let’s say it’s in a dungeon corridor. White Spy is sneaking up on Black Spy who is looking the opposite way. [20:03] <+Jason> White Spy has d6 Body while Black Spy has d6 Mind and is listening. It’s deathly quiet, so Black Spy rolls d6+2 instead. [20:03] <+Jason> White Spy rolls a 4. Black Spy gets a 5. OH NO! [20:03] <+Jason> White Spy needs to beat a 5. [20:03] <+Jason> There’s two ways to do this. [20:04] <+Jason> Spend Brownie Points to get +1 for each point spent, or a point for each additional die rolled, in the hope of getting a 6. [20:04] <+Jason> Or do the die roll then spend more to get extra +1s. [20:04] <+Jason> So White Spy decides to burn 2 BPs and get 6 and beat the 5. Black Spy is a normal character so has no BPs. [20:04] <+Jason> So, sneaking succeeds. [20:06] <+Jason> The Fireball (which is a Talent in TAR) does 1d6 damage. But with Advantage, White Spy gets to roll 2 dice and keep the highest. So he rolls a 3 and a 6. He keeps the 6. [20:06] <+Jason> Now Black Spy’s armor may save him. He’s wearing leather (chain removes advantage). [20:07] <+Jason> That’s a d6, so rolling that it gives a 3. [20:07] <+Jason> Wounds are the difference between Damage and Armor rolls. So that’s 3 Wounds that Black Spy takes. Ouch. [20:07] <+Jason> Every Body roll now is at -3. [20:07] <+Jason> And if he’s going to do any Active Talents, he’s going to have to roll for Strain now as well, because he’s over the basic threshold. [20:08] <+Jason> And that includes Initative. [20:08] <+Jason> But here’s the cool thing. [20:08] <+Jason> If White Spy had taken a small stone and thrown it beyond Black Spy, so he was distracted and wasn’t listening. [20:08] <+Jason> Well, he’s no longer actively listening. [20:09] <+Jason> So that +2 he got for the quiet? It goes away. [20:09] <+Jason> Which means White Spy didn’t need to burn the BPs. [20:09] <+Jason> So, it’s all about the narrative and how you approach things, and how the Judge interprets your actions. [20:09] <~Dan> I note that you went with damage reduction rather than AC for armor. [20:10] <+Jason> In D&D AC is a combination of mobility and damage reduction in one roll. [20:11] <+Jason> In PD it’s all about conflict and opposed rolls: attack vs defense, and damage vs armor. [20:11] <+Jason> End result is wounds or no wounds. [20:11] <~Dan> That’s the way I prefer it, and was a wise choice, given your intention of covering other genres, IMHO. [20:11] <+Jason> It adds an extra dice roll, but it makes it meaningful. [20:11] <+Jason> You may hit the target, but the armor saves. [20:11] <+GeneR> Excellent way to handle damage. I always disliked the D&D way. [20:11] <+Jason> Yes, this isn’t just meant to emulate D&D, but other games. [20:12] <~Dan> The problem you get with AC is that it doesn’t account for the force of the attack. [20:12] <~Dan> So when you get into modern and futuristic combat, it becomes increasingly ridiculous. [20:12] <~Dan> Oh? How do those work? [20:12] <+Jason> Once again, very simple, and all based on the rules. [20:13] <+Jason> It’s just about rolling the high result against the low result. [20:13] <+Jason> If you’re attacking and get max value on the die, and they get low value, it’s a critical success. [20:13] <+Jason> It’s the opposite for a failure. [20:13] <+Jason> And the Judge handles what happens contextually, with some guidelines. [20:14] <+Jason> It could give an extra die for damage (the most common result), to receiving strain etc. [20:14] <+Jason> Mechanically it’s easy to handle. But it’s all about the narrative. [20:14] <+Jason> Intersting and fun things happen when you fail, especially so when you fail hard. [20:15] <+Jason> Succeeding al the time gets boring. [20:15] <~Dan> Hmm. I think I see a potential problem with the crit rule. [20:15] <~Dan> Well… it seems as though it makes characters with lower ability levels more likely to crit. [20:16] <+Jason> There is that. But there’s some ways to mitigate that with crit ranges. It’s explained more in TAR. [20:17] <+Jason> There’s a couple of options that Judges can choose to use, depending upon how they want to do things. [20:17] <~Dan> Like degree of success, maybe? [20:17] <+Jason> That’s one of them. [20:18] <+Jason> But that adds more maths, but that’s up to the Judge. [20:18] <+Jason> PD is about presenting the options and letting the Judge decide, and the hack it as well. [20:18] <+Jason> But keeping it all concise. [20:18] <+Jason> That’s why the core book is 48 pages in size at 6×9 trade format. [20:19] <+Jason> And it’s all expanded out in TAR. [20:19] <+Jason> (Although there are other reasons). [20:19] <+Jason> I wanted to create something that could be self-contained and played at a moment’s notice, and was complete. [20:19] <+Jason> And make it affordable for people. [20:20] <~Dan> An admirable goal. [20:20] <+Jason> It’s designed for new players to easily grok and start playing. [20:20] <+Jason> Every couple of weeks I GM at a local library, where we’ve been running a club for 3 years. [20:21] <+Jason> Most of the kids that turn up (up to 30 at a time) have been with us from the start. [20:21] <+Jason> Sometimes we get new players who’ve never played before. [20:21] <~Dan> Never played any RPG, you mean? [20:21] <+Jason> Or we end up with less GMs and need to have large tables. [20:21] <+Jason> Or have only played one RPG. [20:21] <+Jason> And making characters takes time, even with games like Labyrinth Lord etc. [20:21] <+Jason> With PD, you’re up and running in 15 mins. [20:22] <+Jason> Take a character sheet, choose a class, copy the attributes, choose some talents, equip some gear, and go. [20:22] <+GeneR> Making a Character can be a fun part of the game, but you want someone who is new to be able to jump right in. [20:22] <+Jason> And teach the rules as you go. [20:23] <+Jason> GeneR, you can still get deep with character creation. The Schtick and Quote of a PD character are just the entry point. By characters develop through emergent play and interaction with the other characters and the world. [20:23] <+Jason> But if you’re handling 15 teens, or a convention where you have new players who need to play? You don’t want to lose an hour making characters. [20:24] <+Jason> Sure, you can have pregens. But if you run out of those? [20:24] <+Jason> Plus, pregens are often impersonal. [20:24] <+Jason> So, this game is designed for things like library and convention play. But also extended play. [20:25] <+Jason> You can run campaigns with it, and convert out classic adventures. One of the players in the G+ Community has just converted B2 Keep on the Borderlands for play and been running it. [20:26] <+Jason> That’s why in the Basic book I included most of the classic monsters. [20:26] <+Jason> The Book of Monster will add more, and go a little more indepth. With that and the Basic book, you get about 120 monsters to play with. [20:26] <~Dan> It strikes me that with the removal of limits on spellcasting (beyond wounds/fatigue), magic-users are really nasty in this game. Did you lower the power of spells to compensate? For example, are offensive spells “auto-hit”? [20:27] <+Jason> The Book of Loot gives lots of cool gear. The Book of Magic adds more Talents etc. [20:27] <+Jason> Lightning Bolt and Holy Bolt are auto hit. [20:27] <+Jason> But the more powerful spells aren’t. [20:27] <+Jason> So Fireball get “saves”. [20:28] <+Jason> But the thing to remember is that player magic users can be poweful. [20:28] <+Jason> And so can opposing magic users. [20:28] <+Jason> What players often forget is that the bad guys have access to the same stuff. [20:28] <+Jason> And there’s usually always something that counterbalances things. [20:29] <+Jason> So there a lot of Talents that offer things like that. [20:29] <+Jason> The beauty of the system is that you can easily construct a Talent and something that opposes it alongside each other. [20:30] <+Jason> And you can’t learn new “spells” until you get someone to teach it to you and then spend the BPs to get it at the first level. [20:31] <+Jason> You can also mess things up further by using the simple non-class rule that comes in TAR, which says you can buy out of class Talents at 2x the cost. [20:31] <~Dan> Does that replace multi-classing? [20:31] <+Jason> So, you can have Rogues with Lightning Bolts, Fighters with Healing Touch, Dwarves with Stand Your Ground and Magic Shield. [20:32] <+Jason> But a Judge can also choose to ignore classes. [20:32] <+Jason> And just say choose a class, and take 3 Talents from all available. [20:33] <+Jason> So you end up playing a classless game. [20:33] <+Jason> Or use the Talent tree approach as well. [20:35] <~Dan> Oh, I forgot to ask: Are your Elves the equivalent of Fighter/Magic-users as they were in B/X? [20:35] <+Jason> I wanted to make something simple, but highly customizable. [20:35] <~Dan> But by default, they can’t wear metal armor? [20:36] <+Jason> In Basic, they get to choose Elf, Fighter, or Magic User talents. [20:36] <+GeneR> I think you need a consistent Dungeon Master to guide the campaign or group. I think that for most games but for this one it is really important. [20:36] <+Jason> That’s in there to counterbalance their power and flexibility. [20:36] <+Jason> Because they can wear Plate level armor. [20:36] <+Jason> Weapon and armor are mostly categories. [20:37] <+Jason> So chain and plate can have non-metal equivalents. [20:37] <+Jason> That makes them pretty powerful, if the Judge allows it. [20:37] <+Jason> But otherwise, the Elf will be able to use Leather, which a Magic user can’t. [20:38] <+Jason> GeneR, yes, you will, but it’s easy to be consistent (and there’s a reason there’s a House Rules page in the back of the book). [20:38] <+Jason> In any game of D&D, it’s all about fairness and rulings. [20:38] <+Jason> Well, the older versions for the most part. [20:38] <+Jason> The newer versions made a push to be more mechanical and rely on that to make things fair and balanced. [20:38] <+Jason> But a Judge/GM should always be impartial and balanced. [20:39] <+Jason> And as with any new game system it’ll take time for a Judge to get system mastery with this game. [20:40] <+Jason> Because there’s a bunch of tropes that it breaks and concepts it breaks. Like no vancian magic, and the whole wounds/strain potential death spiral. [20:40] <~Dan> You mentioned 120 creatures in the core plus the monster book. How many of those are in the core? [20:40] <+Jason> There’s 40 listed in the core. [20:40] <+Jason> Just line entries in two pages of tables. [20:40] <~Dan> Not too shabby, still. [20:40] <+Jason> But enough to go on from that. [20:41] <~Dan> Does the monster book go into more detail about the same creatures in the core as well as introducing new creatures? [20:41] <+Jason> In the free adventure that is being released (soon) for the game, which will be attached to the downloads and released separately, it adds in a bunch of new types of things, including the Lich. [20:41] <+Jason> The Lich will appear in the Monster book. [20:41] <+Jason> Each book after this will be around 48-66 pages. [20:42] <+Jason> Compact, concise. Not necessary, but easy to add for additional options. [20:42] <+Jason> And available as a PDF or print (B&W or color). And getting the PDF gets you a discount on the print version later. [20:42] <~Dan> Will the other genre books be their own games, or supplements to PD? [20:42] <+Jason> That’s part of InfiniBadgers Digital+ program. [20:43] <+Jason> Coming up after PD is Polyhedral Shadows, which is sort of X-files/modern horror. [20:43] <+Jason> After that will be Polyhedral Galaxy. [20:43] <+Jason> There’s another game after that, name still a work in progress. [20:43] <+Jason> Perhaps after that there’ll be one for post-apoc. We’ll see. [20:44] <~Dan> Will those be class-based as well? [20:44] <+Jason> But there’s going to be bespoke games that remove the Polyhedral from the title. They’ll be self-contained and do a specific type of game. One especially is being designed as a slimmer set of the rules for smaller kids. [20:44] <+Jason> Most of them provide the option to play class or classless. [20:44] <+Jason> PD is set up this way because of the tropes in fantasy gaming. [20:45] <+Jason> There’s the ability to have career paths as well. [20:45] <+Jason> And once again, they all can work with each other. [20:46] <~Dan> Any thoughts about a superhero game? [20:46] <+Jason> So you can play a genre-mashing game on Earth and in the starts where magic users and NSA agents and starfighter pilots fight alien menaces. [20:46] <+Jason> Yes, that’s something being looked at. The scaling on that is more challenging. [20:47] <+Jason> So it means some tweaks to things, and making some boundaries. [20:47] <+Jason> But that’s also something that perhaps a third party can do. [20:47] <+Jason> Because the licensing will allow that. [20:47] <+Jason> I thought about using the OGL and Creative Commons, but eventually settled on doing something like Savage Worlds does. [20:48] <+Jason> There’ll be a non-commercial free license for people to create content and publish, which they can nominate content that can be shared. [20:48] <+Jason> The next level is a publisher level version where you can do commercial content. Same thing. Choose what to open and keep closed. [20:48] <+Jason> Those two plug into existing rules sets. [20:49] <+Jason> The third license is a partnership, which gets Infinibadger involved and allows to make a full game. [20:49] <+Jason> The first two will be completely free, and the last will have a variable cost depending upon what you’re doing. But it won’t be expensive. [20:50] <+Jason> Those are all being put together now so that they’re easy to use and understand. [20:50] <+Jason> Because a lot of people get confused about the OGL. [20:50] <+Jason> And Creative Commons has some potential issues. [20:50] <~Dan> In the time remaining, is there anything we haven’t covered that you’d like to bring up? [20:51] <+cecil> how much to you expect the game to grow, like, do you expect to get a wide enough audience to make the tiered licensing worth the headache? [20:52] <+Jason> Cecil, I’m expecting a fair bit of growth due to some things I’m working on, including some marketing and getting out in public at conventions. [20:52] <+Jason> I’m a member of the large G+ OSR community, and there’s a HUGE creator community there. [20:52] <+Jason> They’re highly creative and passionate, and I’ve already got people wanting to create for the system. [20:53] <+Jason> And the more people there are creating content, this helps create the audience. [20:53] <+Jason> My job, as the licensor is to make people aware of the game and what’s available for it. [20:53] <+Jason> It’s hard for a new product that comes out to do well on DriveThru and RPGNow, especially if it’s a game system, and especially from a small company. [20:54] <+Jason> We hit the top 10 within a day on both sites, and are Silver/Copper right now. [20:54] <+Jason> So I think we made an impact. [20:55] <+Jason> Yes, that OSR dropoff is always a concern. I’ve got a bunch of OSR products in the queue people are waiting for. [20:55] <+Jason> It’s about to be updated with lots of PD stuff. [20:55] <+Jason> PD was what I call a stealth product. [20:56] <+Jason> I didn’t announce it all, unlike other products I’ve created. [20:56] <+Jason> And bang, released it. [20:56] <+Jason> So now it has visibility, and I need to keep it visible. [20:56] <+Jason> TBH is a great little system. [20:57] <+Jason> One thing that will help is that I’m the layout guy that did White Star for Barrel Rider Games. [20:57] <+Jason> It sat pretty much at Number 1 on RPGNow for about 8 months, and in the top 10 for the next 4 months. And is still high. [20:58] <+Jason> I’m doing layout right now for Pete Spahn’s WW2 Operation Whitebox game. So people know the quality of work. [20:58] <~Dan> Oh, is that Spahn78 over there? [20:59] <~Dan> Dreamwalker Pete Spahn? [20:59] <+Jason> The Basic book isn’t following my normal release process, as I’m doing rapid releases and updates based on community feedback. It’s an agile development model that tries to keep some transparency in, as well as have people be involved. [20:59] <+cecil> any worry of bloat? [20:59] <+Jason> Pete Spahn is the guy behind Small Niche Games, and makes excellent old school products. [20:59] <+GeneR> For the ignorant, what is OSR? [20:59] <+Jason> Cecil. Always. Which is why keeping things lean and mean is the way to go. [21:00] <+Jason> GeneR: Sure! Old School [R] where R is Revival, Renaissance, Roleplaying etc. [21:00] <+Jason> It’s a little amorphous. [21:00] <+Jason> And everyone has their own definition around either rules sets, style of plays, community or a mix of stuff. [21:01] <+Jason> For me, and I run the website OSRToday which links to new products of interest, as well as great OSR-related content, it’s all that. It’s not just the games, but the ideas and community. [21:02] <+Jason> Old school play is about having fun in a certain playstyle – the player is challenged, the world is co-created, the GM is fair and balanced. [21:02] <+GeneR> btw I had to step out earlier. I see you have a house rules page. Good that helps keep things consistent. [21:02] <+Jason> It’s not about the rulesets for me personally, but about how the play occurs. [21:02] <~Dan> Thanks very much for joining us this evening, Jason! [21:02] <+Jason> Dan, thanks for having me! [21:03] <~Dan> No need to run, btw — I’m just going to log the chat and get you the link. [21:03] <+GeneR> When I used to DM I generally did not like people bringing in outside characters as I felt they often had advanced too easy and had too much magic crap.